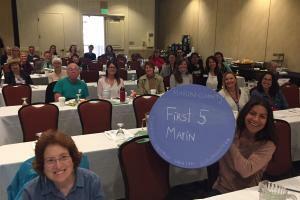 The Maternal Child and Adolescent Health Program (MCAH) develops prevention and early intervention strategies to promote the health of the women, infants, children, and adolescents of Marin County with a special focus on low-income populations. MCAH program staff is involved in outreach, advocacy, policy development, assessment, and program planning to increase access to family-centered, culturally-competent systems of health services. Motherhood isn't always the fairytale you may see in glossy photos -motherhood can be really hard. In Marin County, up to 1 in 5 prenatal/postpartum women report having depressive symptoms. 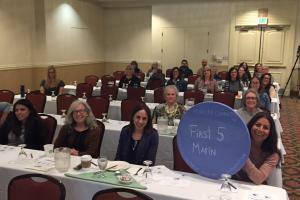 This May is Maternal Mental Health Month and the Marin County Maternal Mental Health Collaborative is rolling out a social media campaign to raise awareness of Perinatal Mood and Anxiety Disorders. They have introduced a BlueDot Campaign with the purpose of decreasing the stigma and shame around maternal mental health disorders and proliferate the BlueDot as the symbol of solidarity and support. The goal of the BlueDot project is to let mothers know they are not alone. The Maternal Mental Health Collaborative is bringing the large Travelling BlueDot to community groups and agencies, taking photos with the Blue Dot and posting these photos on the Health and Human Services social media. Motherhood is hard and it's okay to show it and talk about it! Help us spread the word that mothers are important! If you would like a photo with the Traveling Blue Dot please contact Jenny at jStephens@marincounty.org.